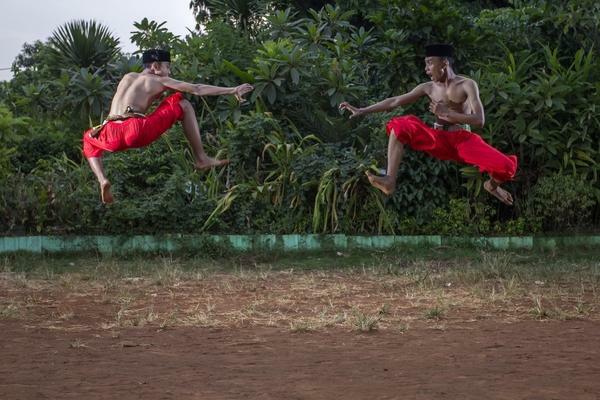 Pencak silat joins the two main branches of martial arts practiced in Indonesia. The appellation pencak was used to designate the Madura, Java and Bali group while the word silat was applied to the Sumatran style. It comprises numerous local variations taught by hundreds of schools throughout Indonesia and Malaysia. It can also be found in Singapore, Thailand, Brunei and Philippines. Although the fighting techniques have long been used, the first evidences of structured teaching come from Sumatra. 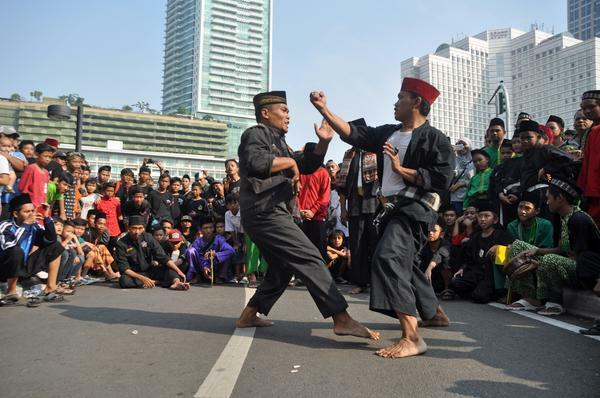 Pencak silat is characterized by two features: tenaga dalam and getaran. The development of tenaga dalam, inner power, is an important aspect of the training. Getaran, vibravision, enables the practitioner to perceive its surrounding without the use of eyesight. Merpati Putih is one of the main pencak silat schools and its origins can be traced back to hundred of years In 1963, master Saring Hadi Poernomo, decided to share with the public the secret science transmitted within his family for almost 400 years. He founded Merpati Putih Pencak Silat School in Yogyakarta. But it would take until 1999 before western people, two American brothers, could be initiated to the science. The school moto is: « Mencari sampai mendapatkan tindakan yang benar dalam ketenangan », or, "To Seek and Find What's Right, Doing It In Silence". Merpati Putih means White Dove. The practitioner must adhere to a number of moral values represented on the school’s emblem. The white means purity and perfection; the white dove is an international symbol for peace and the red and white may refer to the Indonesian flag colors. Red corresponds to the energy one must put into searching for calm; blue is for inner peace and balance. The black color symbolizes rigor. Indecisiveness, anxiety and imbalance are incompatible with pencak silat. The open right hand represents mind openness and tolerance with truth and justice. The gold around the hand is a sign of dignity and greatness. Finally, the bowed head of the dove means modesty and humbleness. Striking, defence and control of the opponent’s movements exist in all martial arts. However, pencak silat is different by its integration of yogic techniques which probably came from the Indian culture. Starting from the first months of his training, the student will practice breathing techniques meant to develop his inner power. Once he has acquired strong concentration and knows how to channel his energy, the advanced student will have access to a powerful inner energy. Inner power has two functions: for the purpose of breaking something hard and for healing. The healing aspect can become very useful in case of injury during sparring. With his hands positioned just a few centimeters from the wound, the advanced student will feel hot, cold or tickling sensations and help relieve the pain by rebalancing the energy. Getaran is the second feature that distinguishes pencak silat from other martial arts. Our surrounding is composed of vibrations. With regular practice of breathing exercises and meditation, the practitioner gradually develops his awareness of subtle sensations. The pesilat learns to set aside his internal feelings to focus on developing more sensitivity to the outside world. Thus, an advanced practitioner can identify vibrations generated by different objects. Blindfolded, he is able to feel and differentiate the character of his environment such as speed, shape, size, etc. According to Merpati Putih members, getaran has nothing to do with magic or supranatural power as many would think. Jean-Marc de Grave, French orientalist and expert in Malay martial arts, explains that human beings possess a very complex perceptual organ to complement the eyesight. Routine exercises and training are the key to sharpen one’s senses. Article rédigé par Lisa C.